…well, all in the details. Put the bucket of soapy water and the chemical-laden upholstery spray down and discover the difference a quality steam cleaner makes. One of my favorites is the McCulloch MC1275, a robust tool heralded among professionals and hobbyists alike. With a 48-ounce water tank, 45 minutes of steam, over a dozen accessories, and convenient mobility, this particular machine helps you get the job done. Just don’t be surprised when the neighbors start poking their heads in to your garage to see how you got your car to look so clean in such short time. Who Can Benefit from Using an Automotive Steam Cleaner? Whether you’re a car collector who restores old vehicles, own a mobile detailing service, or deep-clean your luxury car regularly after long weekend drives, steam-cleaning your vehicle lifts dirt, erases streaks, eliminates odors, kills bacteria, and reconditions interiors. Because steam is naturally-occurring, it doesn’t use harsh cleaning agents or detergents like most upholstery cleaning products do. It’s also very hot so it sanitizes, again without the use of harsh chemicals. 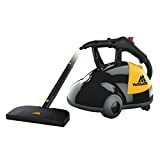 How Can a Car Steam Cleaner be Used? Often referred to as car upholstery steam cleaners, a quality steam cleaner can be used for so much more than just seats, carpet, and door inserts. They can be used on the exterior and interior of a car, plus many can be brought indoors to clean and sanitize carpet, furniture, curtains, grout, and pet beds, too. In your car interior, a steam cleaner can be used to clean floor mats, carpet, headliners, cloth seats, leather upholstery, door panels, dash panels, trim, door jambs, vents, seat belts, and the little nooks-and-crannies that are hard to reach. In the home steam cleaners can be used for all sorts of surfaces including carpets, doorways, tiles, grout, countertops, appliances, etc… Steam cleaners are really versatile tools. Be sure to test a small, inconspicuous spot before using your steam cleaner on any surface you haven’t cleaned before and avoid using the steam cleaner on water-based paint, delicate fabrics, or hardwood floors. Using a steam cleaner is simple, so picking out a machine that works best for you should be, too. While handheld models are more affordable, a portable upright model is more efficient, provides more control, and doesn’t require as many water refills during use. The MC1275 heats up quickly, clocking in at just under 8-10 minutes starting with cold water. The pressure stays consistent even after long detailing sessions. It’s a great tool for just about every surface and soil in the car including sticky cup holders, chewing gum and candy, tight spaces, vents, upholstery, carpets, headliners, leather, and dash and door panels and trim. For the average sized car the cord and hose are more than long enough to reach all the way around and through the car without putting pressure on and dragging on the door sills. The 48-ounce tank provides up to 45 minutes of steam and is just enough to complete cleaning an average sized car’s interior. If the interior really bad you’ll likely still end up using two tanks. If you’re working on larger vehicles like SUVs or extended cab trucks and vans then you might want to upgrade to the MC1385 which has a 64oz tank and provides up to two hours of steam. The only real drawbacks to this machine for car detailing purposes is that after repeated bending and twisting of the hose the outer most protective coating has been known to flake off. This is after a hundred or more hours of production detailing use though, not likely to be an issue for the enthusiasts or shade tree detailer. 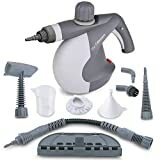 Aside from cleaning and detailing the interior this steam machine can help remove grime from wheels, engines, and chrome accessories as well as clean floors and other surfaces inside your home. It’s one of the few tools in the detailing world that is good for more than just cars which really stretches your dollars out. This is a very straight-forward product with a plethora of attachments and capabilities. If you’re in the market for a new steam cleaner, this is the best bang for your buck. The reason I recommend the MC1275 over the MC1375 is that the MC1275 appears to more reliable and, oddly enough, produces more steam. My guess is that the MC1375 had less R&D and QC time put into it after the success of the MC1275. I also cannot recommend the Harbor Freight version of this steamer, the Central Machinery 1500 watt Steamer. The quality on that one is very hit or miss. The $40 savings quickly diminishes when you end up taking multiple trips to the store to swap them out until you get a good one. The Vapamore MR-100 is bigger than the McCulloch MC1275, but it’s not necessarily better. Sure, the PSI output is a little higher, the power cord is a little lengthier, and the tank is a little bigger to help the steam cleaner run a little longer, but it’s over $180 more than the McCulloch MC1275 on average and isn’t necessarily worth double the cost for the minimal difference in features. Recently redesigned, the Vapamore MR-100 has corrected its issue with dribbling water coming from the hose; older models emitted less steam causing liquid water to drip onto upholstery and carpets. The newest model includes a stainless steel boiler, an adjustable steam output, a solenoid-operated steam valve, and new accessories. While this ultramodern vapor steam cleaner looks swanky and touts upgraded features, using a unit like the McCulloch MC1275 is more than sufficient for enthusiast vehicle detailing. The Vapamore MR-100 is a stellar choice for dirty jobs like pest control and deep-cleaning grout lines, but unless you’re running a commercial production detail shop, you probably don’t need a swanky machine like the Vapamore MR-100. For commercial detailing services and automotive restoration projects, you definitely want something durable and powerful like the McCulloch MC1275 or Vapamore MR-100 to eradicate stains and eliminate grease. But if you are simply a habitual cleaner and just enjoy cruising along the lake in a sparkling, spotless car, you don’t need more than a small handheld pressurized steam cleaner like the DBTech. The DBTech only needs 2-3 minutes to heat up and can perform for 15 minutes per 8 ounces of water. At $29.99, this is the best bargain find with proven results. This little machine doesn’t perform the same miracles as the McCulloch MC1275, but for just under $30, it can get lots of small jobs done. There are many ways to deep clean a car, but steam cleaning is cost-effective, saves time, and eliminates the use of cleaning products with harsh chemicals. It’s also safer on upholstery and carpet because it doesn’t soak the foam backing. Add a McCulloch MC1275 to your detailing routine and you’ll reduce the time it takes you to perform professional level detail. Don’t be surprised if you see an increase in customer referrals with your detailing business or find yourself offering a full detail to your neighbor (in exchange for his prized smoke ribs, of course) once you start using the McCulloch MC1375 – it’s just that good having a steam cleaner.